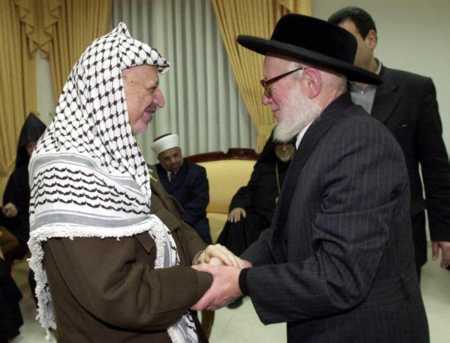 Above: Rabbi Moshe Hirsch of Neturei Karta - Jerusalem, in one of his recent meetings with PLO chairman Arafat in Ramallah, publicizing the fact that Orthodox Jews oppose "Israeli" occupation and conflict with the Palestinians and on the contrary would prefer to live under Palestinian rather than Zionist rule, Rabbi Hirsch has been appointed Minister of Jewish affairs by Chairman Arafat in a future Palestinian state. 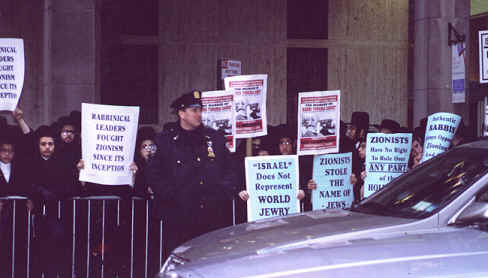 Below: Rabbis from Neturei Karta and other Orthodox Jewish groups protest against Zionism and "Israeli" occupation. 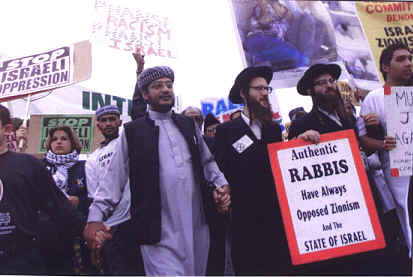 The Neturei Karta is an organization within the Orthodox Jewish community which is dedicated to representing the hundreds of thousands of Orthodox Jews around the world who, out of loyalty to authentic Judaism, remain opposed to the Zionist movement, its embodiment the "Israeli" government and their ongoing occupation and aggression in the Holy Land. It is a once widely known fact that from its onset onset the Zionist movement (created by a known atheist), with its program to transform the Jewish people from a spiritually centered religious people into a nationalistic people, was opposed by the vast majority of religious Jewry and denounced by the great Rabbis and Sages of the time for a number of reasons, some of the main ones being. 1.) Its denial of the future Divine messianic redemption as promised through Judaism's Prophets and Sages and the transformation (or "reinterpretation") of this concept into a natural nationalistic concept (the attainment of a state, army etc). 2.) The bloodshed and disastrous consequences which they foresaw that this movement would bring through conflicts that would ultimately arise from it - especially with the Arab peoples. 3.) The Zionist movement's implicit denial of Divine providence of which we are told in the Torah and Prophets that rule of the Holy Land was originally removed from the Jewish people by Divine decree because of our sins. It is therefore obvious that any attempt to rectify this situation, through human/miltary means, such as the Zionist ideology purports to do, is in opposition to the Torah and is ultimately doomed to failure (see for e.g. the Talmud tractate Kesubos 111a). It is thus that Orthodox Jews have nothing to do with the Zionist ideology or their man made "redemption", but continue to patiently await the Messianic redemption promised by the Biblical Prophets, when, at that time, as we are told, all mankind will recognize the sovereignty of the One Creator, and the words of the Prophet Isaiah will be fulfilled, “And they will beat their sword into plowshares and their spears into pruning hooks”. Although the Zionist leadership and and the "Israeli" government have been successful through terror, deceit and trickery to lead a number of our unwitting brethren astray, nevertheless there still remains a large remnant of hundreds of thousands of Jews both in and out of the Holy Land who still hold onto the unchanging views of true Judaism in opposition to the Zionist nationalist ideology, and who, refuse to recognize the validity of the so-called "State of Israel". These Jews oppose all conflicts with any nation and seek only to live peacefully under the Arab and other nations of the world wherever we live as the Prophet Jeremiah told us thousands of years ago to "Seek the peace of the city wherein I have sent you" (Jeremiah 29:7). In addition we continue to denounce the continued uprooting in practice of Jewish religious law and morality by the "Israeli" government, the majority of whose members are in fact irreligious and do not even hold the basic ritual commandments of Judaism (e.g. Sabbath observance, dietary laws, etc) in addition to their governments open flouting of Jewish moral and ethical laws.